The RCM Board of Directors recently committed $50,000 from the RCM Community Trust to the Milwaukee VA Soldiers Home restoration project. Located on the VA grounds, the Milwaukee Soldiers Home National Historic Landmark District is one of three remaining original Soldiers Homes in the country and it has a rich history. A month before his assassination, President Lincoln signed legislation to create a national system of homes for disabled veterans. Then a group of extraordinary women who made up the West Side Soldiers Aid Society raised more than $110,000 – a staggering amount of money at the time – to create a permanent place to care for injured and disabled returning Civil War Veterans. This was the beginning of veteran care in our country. With 90-plus acres of designed landscape, the Milwaukee Soldiers Home district was designed to create the appearance and feeling of a village and includes a post office, library, recreation hall, theater, chapel and recreation areas. 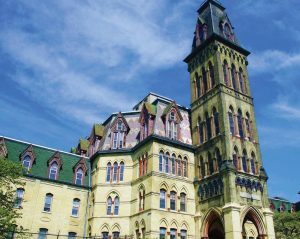 The Milwaukee Soldiers Home is beloved by veterans today who believe its recuperative powers remain. The apartments will be for veterans who are homeless, or at risk of becoming homeless, and their families. Onsite support services will be provided through the Center for Veterans Issues led Rotarian Robert Cocroft. The total cost of the project is estimated to be $40 million. The vast majority of the cost will be covered by state and federal historic tax credits and by low income housing tax credits. There is a need to raise $4 million in private donations. The Rotary Club of Milwaukee is honored to participate in the transformative project that is an excellent example of the development of a national system of medical and residential benefits for disabled veterans. The homes will be places of refuge and recuperation for physically and mentally challenged soldiers whom valiantly served our country. Special thanks go to Lloyd Dickinson, the Military Service Support Committee and Nancy Sennett all whom advocated with the Rotary Board for support of this project.